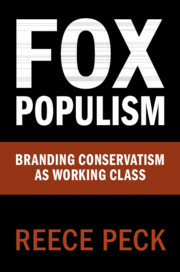 Dr. Reece Peck, graduated in 2013 and currently Assistant Professor at The City University of New York, Staten Island, has published his first book, Fox Populism: Branding Conservatism as Working Class by Cambridge University Press. Dr. Peck’s book is exceptionally timely in its arrival as it explores the ways in which the Fox News has successfully dominated much of American political popular culture. “The book traces the historical development of Fox’s counter-elite news brand and reveals how its iconoclastic news style was crafted by fusing two class-based traditions of American public culture: one native to the politics in populism and one native to the news field in tabloid journalism. Using the network’s coverage of the late-2000s economic crisis as the book’s principal case study, Peck then shows how style is deployed as a political tool to frame news events. A close analysis of top-rated programs reveals how Fox hails its audience as ‘the real Americans’ and successfully represents narrow, conservative political demands as popular and universal.” Congratulations, Dr. Peck!